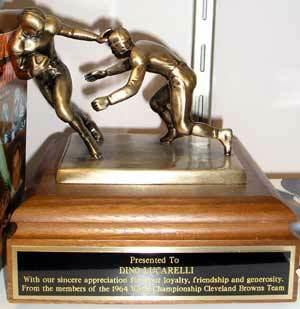 Browns Season is a special time for Clevelanders. 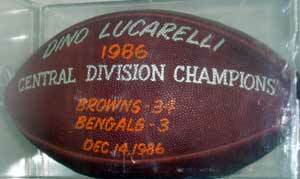 But for some people, like Dino Lucarelli, Browns season is all year long. 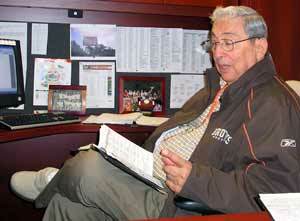 Dino has been with Cleveland sports since 1962 and the Cleveland Browns since 1975. Dino got his start on August 28, 1934 on the southeast side of Cleveland. He had one sister and a brother who died two years ago. He graduated from Garfield Heights High School in 1952 and went to Fenn College at night. He tended bar at his sister and brother-in-laws place, Coceio's but never really liked that. He worked for the Illuminating Company for about 6 months. Other than that he was always in sports in one way or another. He played baseball, softball and basketball. In fact, he says that people remember his playing in an exaggerated fashion. "I was an average athlete, nothing more and not a natural. The longer I'm away from the game the better player I was, but it's not true." He says he just enjoyed the game and was far from being a pro. He remembers playing 3rd base on a softball team for Christy's Eggs, who won the local ASA championship. He pitched for Knapp Wines and played basketball for All Star Sporting Goods and Arrow Realty. 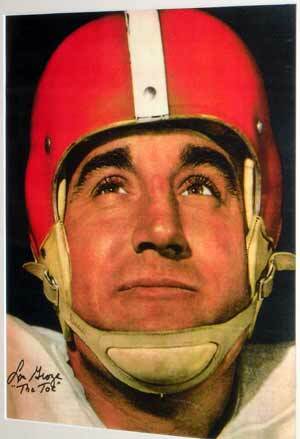 As a kid, he got a job with the Cleveland Bulldogs who played at the old Cloverleaf. In 1962 Dino joined the Cleveland Barons as public relations and promotions director. He tried to develop a strong fan base for the team. He stayed with the hockey team until 1967 when he switched to baseball and joined the Cleveland Indians. He mainly did PR and promotional work for the Tribe. 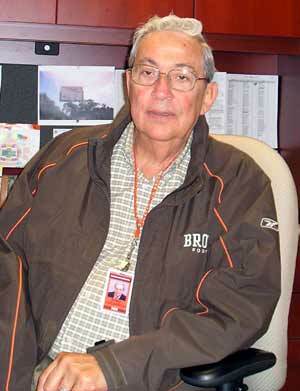 From baseball he switched to football when he joined the Stadium Corporation in 1975 and finally the Browns themselves in 1981. He stayed with the Browns until they made "the move" in 1995. 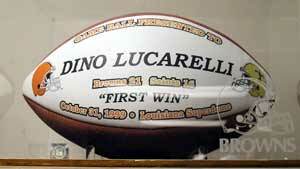 While working for the Stadium Corp. and the Browns, Dino strictly did public relations work. "I was offered a job in Baltimore, but declined it. My life is here." Instead of going to Baltimore with what became the Ravens, Dino went to work for the NFL and the Cleveland Browns Trust. 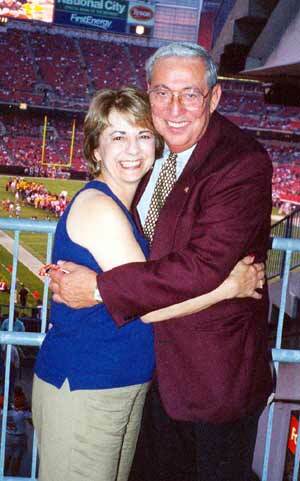 Through whatever means possible, including immense fundraising campaigns, it was Dino's job to perpetuate the name and it was largely in part to his massive efforts that the Cleveland Browns name never left Cleveland. The move had a traumatic effect on Dino. "I was very sorry for all of the people that lost their jobs and very sorry for the fans." He believes that those three years were a testimony to the devotion of Cleveland fans. "There were a lot of angry, hurt people and a lot of hostility. But when all was said and done they came back and we sold suites and season tickets without any problem. Cleveland fans are very intense and very loyal." When the Cleveland Browns started up again in 1998 Dino came back to the organization handling the entire alumni program. He is still doing that job to this day. "I only had to work 6 months in my life - when I was at the Illuminating Company. The rest you can't call work." It is hard to imagine how it must be for someone who works so closely with the team to see them loose. "You never get used to losing in this business. When the losses don't affect me, it's time to get out." Win or lose, Dino is always looking forward to the next game. He is a fan first - and has been from the very beginning. "I was at the very first game in 1946. I fell in love with the team, the colors, the name, the enthusiasm - everything." Even during the times he worked with the Barons and the Indians he followed the Browns faithfully and intently. He remembers as a child tickets for the bleachers were 25 cents on game day. His family let him go, but he had to wear a bright red shirt so they could see him from their seats and make sure he was behaving. He enjoys working for the Browns "I work for a great organization and I think Phil [Savage], Romeo [Crennel], Randy [Lerner] and John [Collins] are taking the team in the right direction. There are bigger and better things on the horizon." Although sports in general have grown larger he doesn't see that the game itself has changed at all since he started. "There is more staff, more services rendered, more sophistication and the fan base is so much larger and more intense." When he first started there were no computers, everything was done by hand or on a typewriter, Copies were made on a mimeograph machine and then a copy machine. "We'd crank them out by hand or even use carbon paper if we didn't need too many". He sees that modern technology has changed the game and of course, there is much more money involved, especially in television revenue and sponsorship. Even though ticket prices are high he feels that the average fan is in a better position to buy season tickets to football games rather than baseball where there are 80 or so home games or even basketball. "The Browns only have 10 home games a year, so fans make an extra effort to attend." Dino reminds us that sports is a business. "Most people pick up the sports department and read it more thoroughly than the front page of a newspaper. It is the Toy Department of the World." He also reminds us that a Browns game is an event, not just a game. Whether you watch on television or in person, there is a certain party atmosphere that is attached to it. When he comes in to work on game day at 7:30 a.m. the Muni lot is already filled with tailgaters. "Some even come the night before. Win or lose it is a social event. College football is the same, it's an event!" Dino is proud of the way the organization has clamped down on bad behavior at the stadium. Every program included a number to call - that doesn't even require the caller to speak - to have security brought to their section. "The Dog Pound is fun not rude. The organization does not hesitate to have someone removed or take away season tickets in the extreme. It must be a fun experience for everyone." 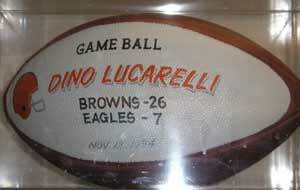 Now that the Browns are in Berea and Dino is at the Stadium he doesn't really know the players -not like he used to. But as head of alumni relations he knows all of the past players and does his best to keep them happy. 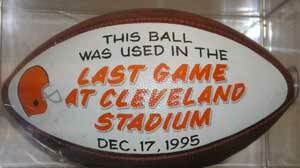 All Browns alumni are offered 2 tickets to each game and on average seventy or eighty attend. "Of course this number increases for the Pittsburgh or Baltimore games." Dino was married to Loretta who died in 2000. Together they had seven children and sixteen grandchildren. Just six months ago he married Angie and inherited three more children and six more grandchildren! In addition to sports, he loves spending time with his family, going out to dinner, family events and holidays. He used to cook some, especially his special sauce, but he hasn't done that in awhile. Although he loves to travel, his schedule does not permit much time for it. In addition to Florida and Las Vegas Dino has been to Italy and really enjoyed the trip. He's never been one for pets. "I had seven kids, I don't need a pet. When dogs learn to flush, maybe we'll get one." Dino has tolerance for most things, unless they adversely affect his family. It takes a lot too make him mad "but when I do get mad I have a really bad temper." Education is very important to Dino. Six of his seven children have degrees and the other is an electrician and doing very well - "and they all seem to be happy." His Catholic faith is also very important to him. "It makes me very happy that all of my kids and grandkids go to Church." He has the utmost respect for all religions but sees it as essential that people believe in God in some form. Dino is in great shape, partially due to the sheer enormity of Cleveland Stadium. He often wears a pedometer which verifies that on a regular work day he walks between three and five miles a day. On game day he averages between 8 and 10 miles! In addition he works out every morning on a treadmill and an exercise bike "Except game day and the day after." He is the recipient of many awards and most of them have titles such as "Good Guy" or "Humanitarian" or "Community Service" or some other term that speaks to his good nature and kind heart. 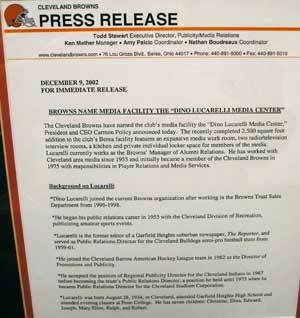 They even named a media room at Berea after him in December, 2002. He has been inducted into the Garfield Heights Little League Hall of Fame and the Greater Cleveland Slo Pitch Hall of Fame. Dino is one of those people you are genuinely happy for. Happy he has the family he has and loves so much. Happy he is in a job that gives him so much delight. Happy he is content and secure in his faith and beliefs. Just happy that he is happy. He is a man who deserves the respect and accolades he receives and then some. He is in a business where egos can quickly get out of hand, yet he is modest and unassuming. He is surrounded by glitz and glamour, yet he is sincere and real. 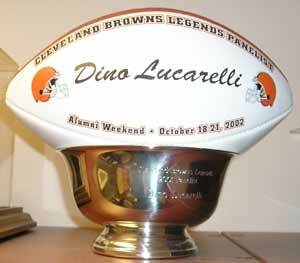 Dino Lucarelli is an asset to the Cleveland Browns and City of Cleveland. Even though his face is not as familiar to sports fans as some of the players, he is a huge part of what makes the Cleveland Browns so special. We are lucky he decided to stay with us for his contributions would have been sorely missed. 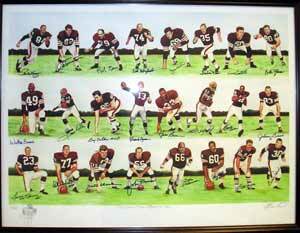 Copyright � 2005 ClevelandSeniors.Com. All Rights Reserved.